Last Thursday I spent the evening in the Northern Quarter immersed in strange sounds and unusual storytelling. 'Kinokologue 1: Sound spore', a temporary sound art installation in the exhibition space at MadLab, was the culmination of a Cornerhouse/Paul Hamlyn Foundation Micro Commission, followed by Kinokophonography upstairs, a regular listening event which showcases sounds sent in from all over the world. 'Kinokologue 1: Sound Spores' was an interactive collection of sound specimens arranged as 'spores' embedded in different objects. Spores were tucked in drawers and filed neatly in a cabinet ready to be opened, or presented as threaded images, interpreted by embroidery artist Akiko Yanagimoto, framed in glass as if in a collaged scene. 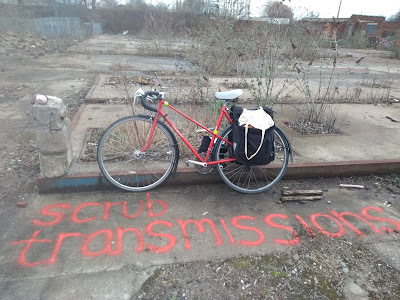 At the same time as vintage objects were reused and reinvented as listening posts, everyday sounds plucked from their context took on a new meaning as part of a growing sound archive. Listeners were invited to borrow headphones, wander round and get ready to listen closely, then help classify sounds by suggesting categories or turning dials to bring sounds together into compositions and writing down instructions based on successful combinations for future visitors. Although samples included recognisable sounds and even those we might conventionally call music — the meandering of a violin, piercing whistles — the most exciting sounds to explore were those that did not have an obvious source. Burbling water and crunching leaves are atmospheric, but more elusive sounds such as faint 'put-putting' or vaguely familiar scraping are the most interesting as, rather than placing you directly in a scene in your head, they make you listen again and again to try to remember back to the situation in which you've heard them before (if at all). — such as the simple, repeated onomatopoeia of the Japanese word 'nyokinyoki', but the recordings presented on the night were not heard in isolation. Contributors either introduced their recording in person or sent a description and context for their sounds, whether a reminiscence about a visit to the dentist that brought about a recording of a dentist's drill and suction — "my pain is your listening pleasure", an anecdote about the conditions in which the recording was taken — conjuring up the exposed, windswept discomfort of hanging around on the side of the mountain to record a pile of rocks, or more technical descriptions about how the sound was achieved — as in 'Growth of reverb', a recording taking advantage of the effects of footsteps on the acoustics of a stairwell at the University of Manchester, a place that was well known to some of the audience. Even those recordings that feature the presence of people are disorientating once stripped of their context: you wouldn't have guessed the setting for a conversation between young people unless told it took place at a goth festival in Whitby. Sitting in a room of neatly arranged rows of chairs listening to recordings might seem like a strange concept for an evening, but the host described it as a way to "find out about the world by listening to what's around". Whilst my expectations of what an ice berg in Australia would sound like (sparse, barren, windswept) were confounded (it actually sounded bubbling, watery and alive), the recording of a busy, noisy, early morning in Mombasa sounded as if it could have been taken from any urban dwelling or office block with the window open on a summer's day. Recordings such as the Amazon rainforest, taken from the British Library, with its variety of sounds and array of natural wonders (including a bird whose recurring call descended a scale in a way that was almost comical and another bird whose insistent brilling made you wonder if it was the inspiration for the telephone's ring), and an amazingly evocative amplification of tree roots creaking in the wind like groaning wooden furniture, achieved in Lithuania using contact mikes, were beautifully observed. However, my favourite recording was of a sound so ordinary you would not normally think to stop to listen to it. A recording of the shaking of a tin roof on the Manchester University students' union, caused to move by the reverberations of the bass and drums-dominated practise session of a heavy metal band, couldn't help but make me smile. Find out more about the work of the Kinokophone collective at www.kinokophone.com. 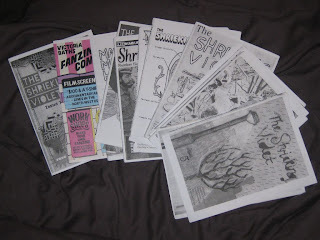 JT: Why, when you started the Shrieking Violet, did you choose to photocopy and have a free fanzine? SV: I'm afraid I won't really give you any passionate, ideological answers, as the way I publish mostly comes down to laziness and convenience. I started off photocopying the the Shrieking Violet because of the immediacy – I could go from finalising the content to publishing and distributing it almost immediately. As there was no waiting around for printers or anyone else to deliver a finished product, it was all up to me. It is very important to me that the fanzine is free so that it is accessible. Having a cost on it – even a small one, is a barrier to the casual reader picking it up. Also, if there was a cost, selling it would have to be regulated somehow – I wouldn't be able to leave it around to be picked up. Again, the process of distribution would lose its immediacy if some kind of transaction had to take place – it would limit where and how it was available. The Shrieking Violet was conceived as an alternative guide to Manchester, as there are number of free city guides which are left around the city – in hotels, cafes, bars and other attractions. It seems that most of them are sponsored by big business and are very unimaginative – they mainly recommend shopping, or visiting the big city museums and galleries if you want some culture. I wanted to offer an alternative to that which was also free and could just be picked up in some of those public places, but gave a guide to things in the city which were free. JT: Why, sixteen issues in, have you kept it that way? 1. There are always mistakes and typos in the Shrieking Violet, however hard I try to proofread it. It doesn't matter quite so much so much if it is just photocopied, as a photocopy feels like a temporary object, but a properly printed publication would feel much more 'permanent' and I would want everything about it to be perfect. 2. Photocopied fanzines are quick, cheap and easy to reproduce – if I got a fanzine printed professionally it would be limited by print run and it would be harder to produce extra copies as and when needed if I ran out. 3. As i'm not really from an art and design background, I feel a bit overwhelmed by all the choice of different papers and qualities and ways of printing as I have never had something professionally printed before, but I do know how to use a photocopier. I grew up around my dad's collection of early 80s punk/indie zines, so I knew that photocopying was a long-established way of making fanzines! 4. 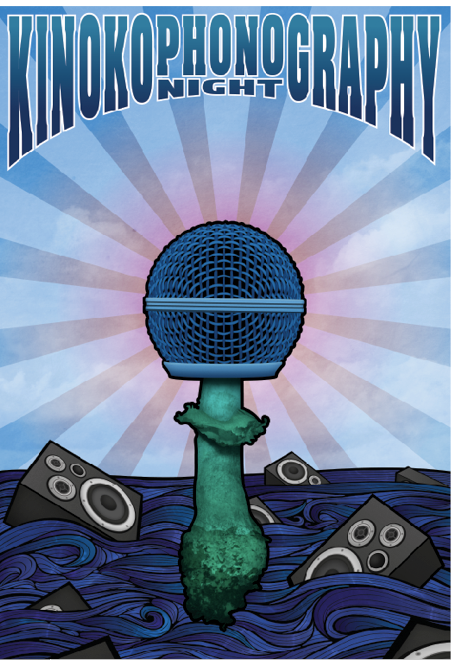 Cost – it's important to me that the Shrieking Violet is free, and if I got it printed professionally I would need the money to do so, which would probably mean applying for funding, or asking for people to advertise, which would be another stage in the process of making the fanzine that would hold the process up. 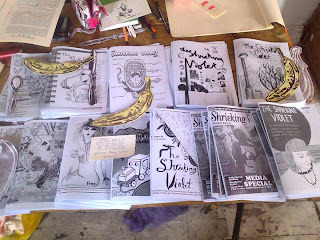 So, in answer to your question about why I continue to photocopy the Shrieking Violet 16 issues in, it is about momentum – I decided momentum and keeping the project going (firstly as a monthly zine then bi-monthly, now quarterly) was more important than worrying about improving the print quality. 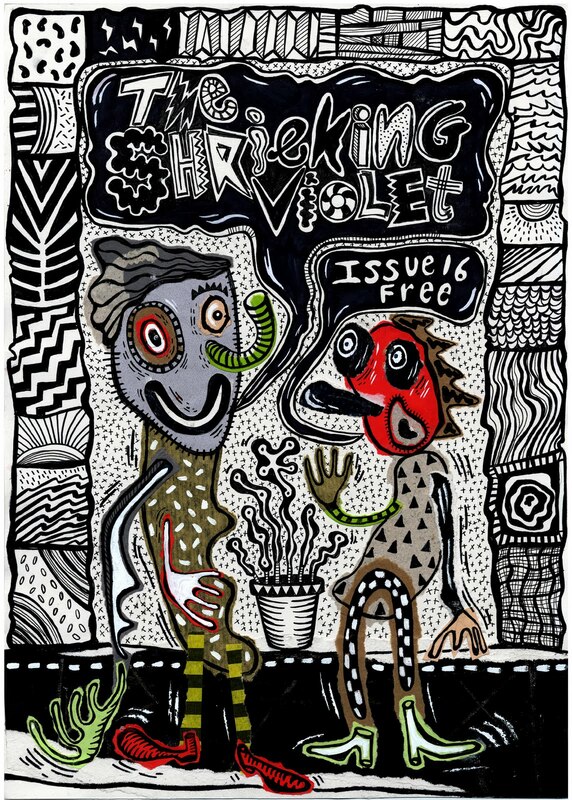 I would love to produce the Shrieking Violet in colour, but I have struck a balance by having a pdf version online which is in colour – and the vast majority of readers are online, important as it is to have a paper version as well. JT: I'm looking at the boundaries of different self-publishing formats and how we define them, so I'd be interested from a zine creator's point of view, what do you think makes a zine a zine? 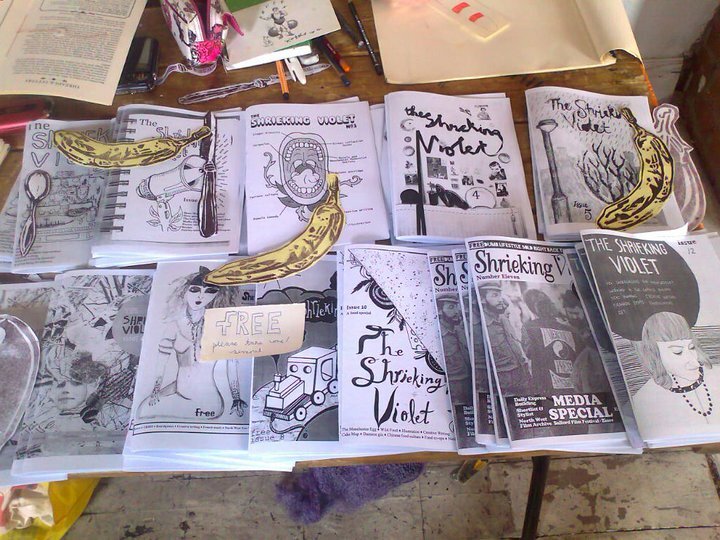 Would you say this sort of aesthetic and free distribution is part of what a fanzine is? Or is it the content and motivation behind the publication which you feel defines it? SV: Regarding content and motivation, I like to think you could call the Shrieking Violet either a fanzine or a magazine. The distinctions between fanzines, artists' books and magazines are often a lot less clear than is made out. I would prefer for the Shrieking Violet to be defined by the content and the quality of the writing inside it rather than how it is delivered. The content and standard of the writing and range of contributors is always the most important thing and not the format it is made in. Just like blogs – I feel they should be judged by the quality of their content just like any other website and not by the medium in which they exist. I don't know if I can define what makes a fanzine a fanzine as they vary so much. I'm not sure there is an 'aesthetic' that can be linked to fanzines as they range from the very, very basic – handwritten and photocopied – to more 'crafted' artists' books. I have thought about this a lot over the past couple of years, and I have come to the conclusion that 'self-publishing is a far more helpful word/concept than 'fanzine' because it is much broader and encompasses many different types of publications and many reasons for publishing, but the thing that often unites them all is autonomy and the freedom to be your own editor and maker. Issue 16 features Bert Jansch, Manchester's typography, city quarters, Esperanto, Belle Vue, smokey beans, creative writing, poetry, embroidery and illustration. I have been thinking about the different types of quarters that seem to be appearing more and more, not just in Manchester but in other towns and cities I have visited. Nija Dalal is a writer and radio producer, and has just finished an MA in Anthropology. She's radio obsessive, cooks and crafts and sews, and keeps a blog about it when she remembers. She grew up in the American South, in a bizarre immigrant household, though no more bizarre than most immigrant households. She says "y'all." Currently in Manchester, she's lived in Sydney and Atlanta, and she's looking for a job in radio (do you have one going, by the way? )...Nija has condensed some of her Masters thesis findings into an article about the anthropological implications of Manchester's typography. Bill Chapman, who has been speaking Esperanto since 1967, got in touch with me offering an insider's perspective on an article I wrote about the Esperanto for the modernist issue 1. 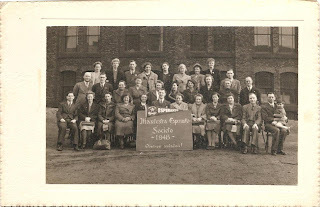 During our subsequent exchange of emails, he sent me a photo of the Manchester Esperanto society in 1948 (motto 'Obstinately onwards'!) and told me about the adventures Esperanto has enabled him to have. Esperanto celebrates its 125th anniversary next year, and I asked Bill to expand on his stories in article form for the Shrieking Violet. Bill is a magistrate in north Wales and has worked for many years in education and training, most recently in the field of lifelong learning. He is enjoying being a grandfather. Long-time contributor and friend of the Shrieking Violet Rebecca Willmott describes herself as 'a self publisher with a specific writing interest in revisiting the circus with a needle and thread'. Her favourite things are: pumpkins, clowns, embroidery hoops and running writing and book binding workshops with children and sometimes adults, 'but children are more curious'. Manchester's Belle Vue circus holds a particular fascination for Rebecca, and she has written and embroidered an article on it. Rebecca has just moved to London to start an internship at textile magazine Selvedge. Louise M. North wrote her first story, about a blue apple, aged 5. She likes writing about the odd, the weird and the wonderful and, if she can manage it, the odd, weird and wonderful all in one story. Louise has combined the odd and weird in a story about a recognisable Manchester locale, with an illustration by Alex Boswell. Cyrus Amini, who has contributed a poem to issue 16 of the Shrieking Violet, has previously been an independent video producer and broadcast professional. He now develops property nicely but mainly concentrates on enjoying himself. Mr Jacket's smokey beans recipe came to the Shrieking Violet via Morag Rose of the Loiterers Resistance Movement. I have tried and tested it and recommend eating hearty helpings on top of toasted, buttered rye bread for dinner on a winter's night, with the leftovers for lunch the next day. The cover is by Manchester-based illustrator Bryony Jackson. I'm really pleased as I have long been a fan of Bryony's work and have been asking her to design a cover ever since the Shrieking Violet started back in August 2009! Daniel Fogarty, an artist and designer based at Rogue Studios in Ancoats, kindly assisted with the design and layout. Remember, this publication is best read whilst listening to guitarist and singer Bert Jansch, who died of cancer last month. Download and print your own copy of the Shrieking Violet here. Very badly photocopied copies will be left around various places in the city centre this afternoon and tomorrow afternoon, including Piccadilly Records, Good Grief! shop (in the Soup Kitchen), Koffee Pot, Oklahoma, Nexus Art Cafe, Cornerhouse. The Shrieking Violet won Best Arts and Culture Blog at the 2011 Manchester Blog Awards which took place during Manchester Literature Festival, after being nominated for the third year in a row. It was good to hear readings from other blogs at the awards ceremony, and to hear the winning entires in the Real Story competition, including Shrieking Violet contributor Nija Dalal! It was a shame that I was rushing off to the Jens Lekman gig at Band on the Wall, on the other side of town. Many thanks to anyone who read, nominated or voted for the Shrieking Violet. Other winners included Shrieking Violet issue 10/Manchester's Modernist Heroines contributor Hayley Flynn, who won Best City and Neighbourhood Blog with Skyliner. David Bailey, who designed the cover for the Shrieking Violet issue 10, won Best Personal Blog for Food Legend. I've been dipping in and out of the artist Ryan Gander's book Catalogue Raisonabble Vol. 1. My favourite bits of the book are his writing, especially extracts from his 'Loose Associations', interesting essays which flit from topic to topic in 'loose associations'. These led me to a brilliant magazine called Dot Dot Dot, produced by Stuart Bailey of Dexter Sinister, in which some of Gander's Loose Associations appeared. I've been reading issue 19 of Dot Dot Dot, which compiles editions of a newspaper called THE FIRST/LAST NEWSPAPER which was issued from Port Authority for three weeks during November 2009. Content is a mixture of archive material and contemporary articles written by different international artists and writers, some fairly short and others more in-depth, quite often concerning the media, the history of the press, the evolution of publishing and mass communication. I recently watched this lecture from 2007, which has contributions from Stuart Bailey, as well as Michael Bierut from the website Design Observer. I really enjoyed hearing about how Dot Dot Dot started and developed as a magazine, and how it received submissions of content that was not what you would expect to find in a graphic design magazine but the editors published it anyway to change conceptions about what 'should' be printed. I was also interested in Michael Bierut's talk about how Design Observer started and grew, and attracted readers despite the length of its posts! He made some observations about comments on blogs and blogging 'communities'. I am often discouraged that there are few comments posted on the Shrieking Violet (especially negative comments) and the lack of discussion or debate around anything I write. Birmingham has seven designated city quarters1, Sheffield eleven2. In Manchester, the well-known Northern Quarter (and slightly less well-known Green, Civic and Millennium Quarters) will soon be joined by a co-operative quarter (although the Co-op Group hopes the public will take to its official name, NOMA, speculated to be a reference to its geographical position just north of the city centre3) and another, a Medieval Quarter, is proposed. Add to that other well-defined areas of the city which are not officially designated quarters, but could be seen as such – Canal Street and surrounding Gay Village as a gay quarter, Chinatown as a Chinese quarter, a university quarter around Oxford Road – and there are a lot of slices that make up Manchester. There is a bewildering away of terms for dividing up the city into convenient chunks: corridors (the area around the universities and university hospitals is packaged as the corridor, Manchester's “economic and knowledge powerhouse”4), gateways (Southern Gateway, a new residential and business district in an area which had suffered from "a lack of identity and economic purpose"5), an urban village (Ancoats), the UK's first Urban Heritage Park6 (Castlefield) and even a curry mile. The language and concepts used to describe quarters is similar to that applied to these other corridors, gateways and urban villages, and they share many of the same attributes and aims – rejuvenating an area through mixed-use developments that will attract business and investment to the city and help raise its profile beyond the city boundaries. Quarters often reflect the aspirations of a place, and are used as a way of conveniently packaging and marketing the different types of activities that make up the diverse life of a town or city. If a town or city has a well-defined creative quarter, for example, a hub of cultural industries, it will not just attract creative people but will also catch the eye of tourists and shoppers eager for an alternative retail or leisure experience. This provides customers for other facilities such as hotels and transport, and therefore acts as an incentive for business investment. Likewise, a heritage or tourist quarter puts a city's attractions conveniently into one place for visitors – and attracts the sort of retail or dining experiences that go with it. The use of quarters to define areas of a city is nothing new. Think of Paris's quartiers – meaning living quarters. Cities have long had designated areas based on ethnicity – Jewish Quarters being a widespread example – and Birmingham, to name just one city, still has Irish and Chinese Quarters. Other quarters grew up around shared characteristics uniting the people who lived or worked in an area, such as speaking a common language (Latin around the universities in Paris' famous Latin Quarter, during the Middle Ages, a name which struck). Other quarters were named after the industry that was prevalent in an area, for example Birmingham's renowned Jewellery Quarter, catchily marketed as 'Birmingham's Gem'7. Or they may simply be descriptive of what's there, like Altrincham's Market Quarter, or what goes on there, such as Leicester's Business Quarter. Others are defined in geographical terms, including Manchester's Northern Quarter, which also goes by the postcode N4, or based on obvious physical attributes, such as Stoke-on-Trent's Canal Quarter. Others reflect the type of people the area has come to attract, or wishes to attract, or tells members of a certain demographic they will find likeminded people there – for example Liverpool's Gay Quarter. They can also be a tool in conservation, if a number of noteworthy buildings are clustered in one area. Manchester's Civic Quarter, outlined in 2009's Civic Quarter – Manchester Central Regeneration Framework, aims to use Manchester's heritage, including some of its key buildings – the town hall, central library, Manchester central and St Peter's Square – as well as its transport links and infrastructure, to attract business and institutions to Manchester in “a new meeting place in the city centre”. Its goal is to extend both the city centre and business district and: “Bring together the values of civic pride and civic leadership, with international trade and commerce, world class innovation and research, at the heart of an entrepreneurial community.”8It also acts as a link between the various other districts that comprise the city centre: Spinningfields, the corridor etc. The proliferation of quarters all over the country today, some based on a logical connection with an area and some more tenuous, often coincides with redevelopment and regeneration. Manchester's Millennium Quarter (there are also Millennium Quarters/Villages in London) refers to the redevelopment that took place around Manchester Cathedral after the area was destroyed by an IRA bomb in 1996. Its name reflects that rebuilding took place in the lead-up to the Millennium as well as the fact it incorporated one of a number of national projects funded by the National Lottery through the Millennium Commission9. Typically, quarters incorporate new or improved public space (Cathedral Gardens, check), retail (Selfridges, Harvey Nichols, the Triangle, check), leisure (the Printworks, check) and residential opportunities. Often, refurbishments of traditional buildings sit alongside eye-catching new builds. The Millennium Quarter acknowledges Manchester's past, containing some of its most historic buildings (the cathedral, Chetham's Library), but it also contains new flagship development such as Ian Simpson's Urbis building, which was conceived as a museum for the city. Soon, the area could have another quarter, currently dubbed the Medieval Quarter10 by local media, that will straddle two city centres, linking to the Greengate development in Salford. Plans include a new cathedral square, as well as a redesign of Cathedral Gardens, new memorials to the anti-slavery movement, the suffragette movement and firefighters. A statue of Oliver Cromwell, currently in exile in the suburbs, could also be moved there. Just down the road is NOMA – colloquially dubbed the Co-op Quarter to reflect the fact that the Manchester-based Co-operative Group is redeveloping a huge, 20 acre site11 near its new headquarters. The £1 billion plan, funded by the Co-operative Group with some investment from the Council, will see the makeup of the area fundamentally changed to attract new up-market shops, offices and cafes, potentially generating thousands of jobs. New public spaces will be created and the inner ring road will be moved. The Co-operative Group will be hoping that the quarter can be seen as a physical manifestation of its values, which include commitment to community and environment. Quarters can create a sense of place. Put a name on it and people can feel an affinity with a place and identify with the characteristics associated with it. As people are increasingly encouraged to live in city centres as opposed to the suburbs, residing within a distinct quarter makes it a lot easier to see yourself as part of a neighbourhood. When asked where you're from you might no longer have an area such as 'Chorlton' or 'Withington' on the tip of your tongue, but being able to say you live in 'the Northern Quarter' or 'the Green Quarter' helps whoever you are talking to identify a more specific locale than the more general term 'city centre', which encompasses a wider geographical area. The advantages of this for developers are clear: from 2004 onwards, the Green Quarter was created just outside of Manchester City Centre, referring to the largest ever housing development in the city. Developers Crosby Homes promised a “self-contained urban oasis, combining 10 cutting-edge apartment blocks, business accommodation, hotel, leisure and retail facilities set against the precious commodity of lush landscaped open green space”. Sold on its close proximity to Victoria Station, the MEN Arena, the Printworks and leisure and retail opportunities, the developers highlight “the convenience factor of a lifestyle on their doorstep”. They tempt: “Are you addicted to city living, yet yearn for more than a splash of greenery? Do you enjoy the buzz of the urban social whirl and the spark of metropolitan business, but would relish having a haven to escape to?”12The green part? It was envisaged that more than half of the area would be public open space with lawns, tree-lined walkways, water features and landscaping. A common example of the adoption of quarters as a regeneration strategy can be seen in cathedral quarters, which are found in towns and cities around the country, including Sheffield. Blackburn's town centre strategy13 works with “the inherent and distinct uses of existing areas”, including the cathedral quarter, which has “one of the most established identities in the town centre”, to “encourage a unique sense of place”. Heritage quarters are being established in towns and cities including Gravesend and around the harbour in Sunderland. University quarters include Stoke-on-Trent's catchily-named UniQ, a partnership between local education providers that aims to raise aspiration and increase skills in the town. One of the most prominent types of quarters is the creative, or cultural quarter, which can be found in towns and cities around the country including: Southampton, Brighton, Folkestone, Birmingham, Sheffield, Leicester, Oldham, Liverpool, Stoke-on-Trent, Doncaster, Boston, Colchester, Leamington Spa, Wolverhampton, Bedford, Bury and Warrington14. The Local Government (LG) Improvement and Development Group put together a guide to cultural quarters, which it defines as “an existing cluster of creative and cultural industries, or the desire to create a cluster of creative and cultural industries”15. Quarters give creative people the opportunity to “work, live and socialise in one environment”, and the LG foresees the associated networks and facilities growing up around them. In Folkestone, Kent, the Creative Quarter was initiated by a charitable Trust buying and refurbishing, then letting, empty properties to creative businesses and artists, supplemented by events such as a book festival and art triennial16. Cities change and evolve up over time. The name 'Northern Quarter' entered popular use because it referred to an area which already had a distinct identity and role in the city. Few people outside those who live in the Green Quarter refer to it as such (or would even have reason to think about it as a 'place'), and it remains to be seen whether the other quarters, or even the name NOMA, will enter popular conversation as place-markers. Quarters have been at the back of my mind for a while as something I would like to know more about. Above is merely a collection of things I found interesting about them. If I had had more time and space I would have liked to have also thought about the creation of Spinningfields as a 'luxury shopping quarter', and thought more about other concepts such as urban villages and had a closer look at the overlap with quarters and the language that is used to define and sell them. 11 See http://www.noma53.com/ for more information on what's proposed. 13 See http://www.blackburn.gov.uk/server.php?show=ConWebDoc.2472 for more information on the town centre strategy. Ann Markusen, 'Arts & Culture as Regeneration: Four UK Cities Experiences' from GSA on Vimeo. Graeme Evans, Creative Cities, Creative Spaces? Form and Function from GSA on Vimeo.